Well, this is such an interesting thing to be going thru. So it seems that the floor is like a giant jigsaw puzzle. To me, it’s extremely important that the old floor be reproduced piece by piece and I’ve been fighting the “You vant to mitre corners” demand. No Boris, I don’t vant to mitre the corners. (In the meantime, Boris is showing me photos on his phone of all sorts of inlay floors he did at extreme expense. They look like swirly fans and flowers gone wild in various shades of wood. “Dis million pieces,” says Boris, “Dis wery expensive.” I’ve no doubt, but dis this is a Craftsman floor, it must be simple and no mitred corners please. I have chosen a wood floor, but you happen to choose a concrete floor it will surely need upkeep, polished concrete perth will provide you the services you require. 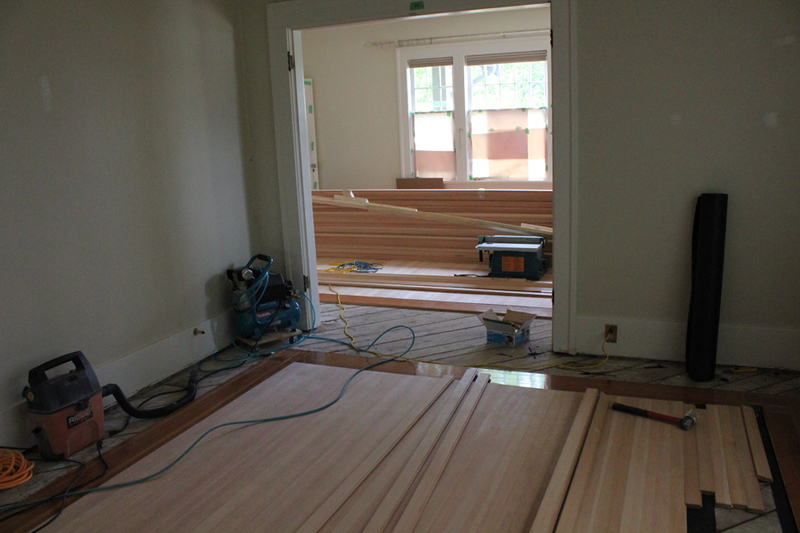 Well, the first day day of reconstruction happened within the old marquetry borders. 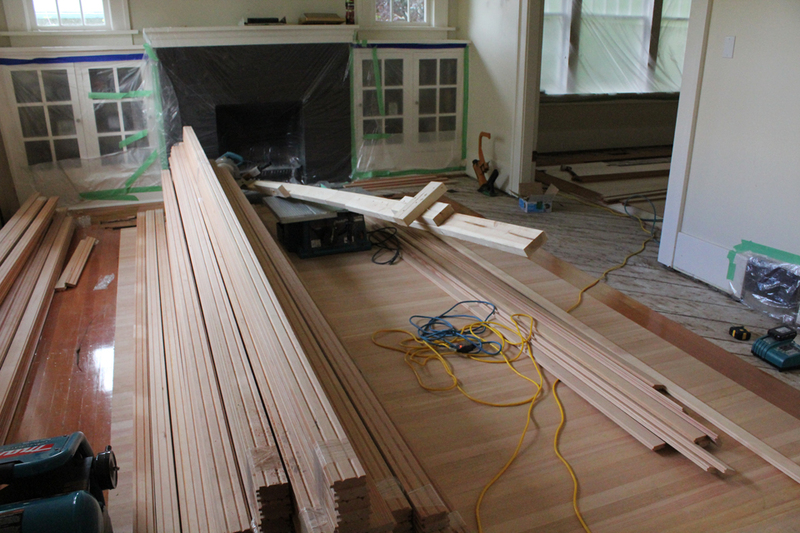 The hardwood floor refinishing was made just as the old floor was in great swaths of lengths. The second day of floor reconstruction was consumed with carefully removing the marquetry and reconstructing it in new wood. 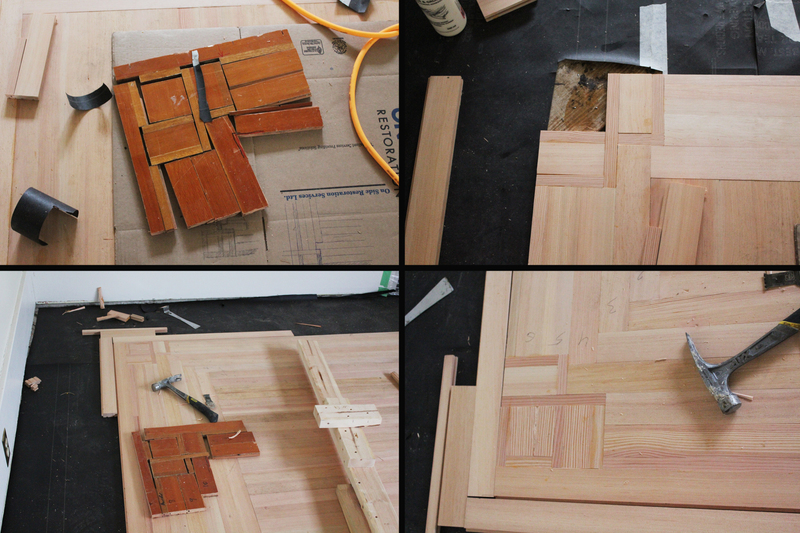 Boris #2 painstakingly drew the pattern out on cardboard, cut exact bits of wood and recreated the twelve corners. Read more here. The third day was yesterday. The corners are done, the non-mitred corners are done! Now just the straight forward bedrooms to go. 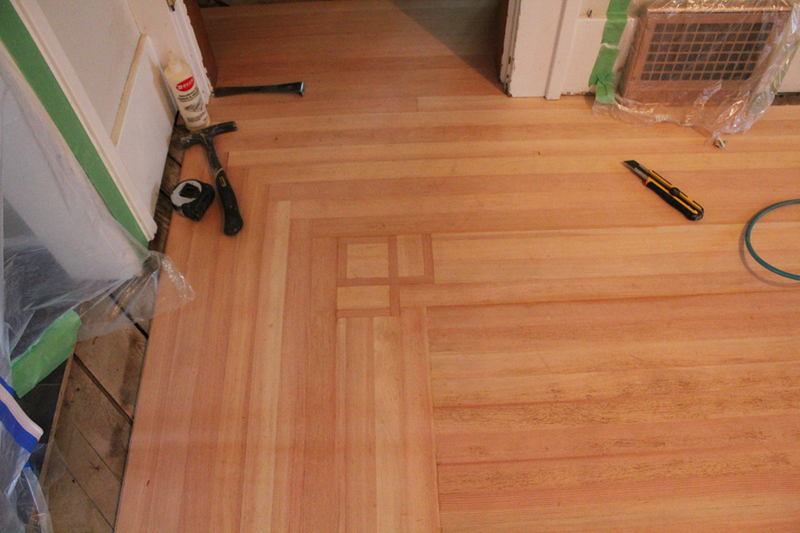 Then the sanding starts on Monday. 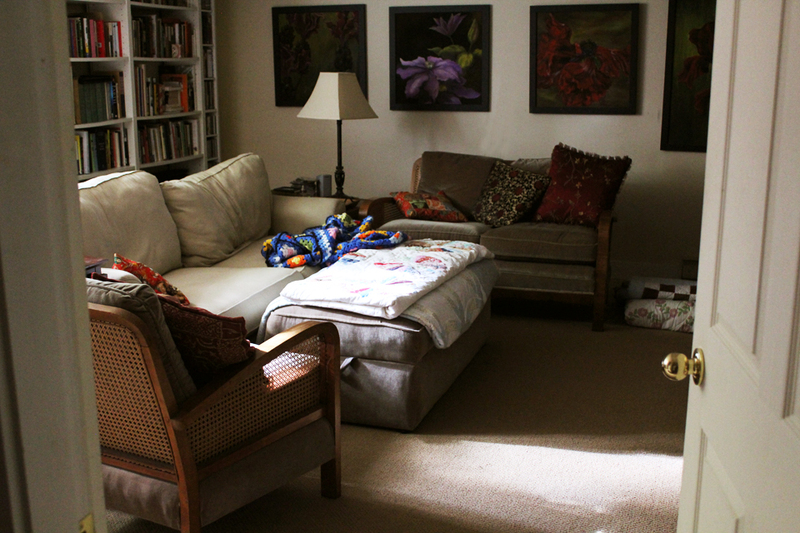 Here’s our little TV room/library where C and I are hanging out at the time. Holy smokes!!! 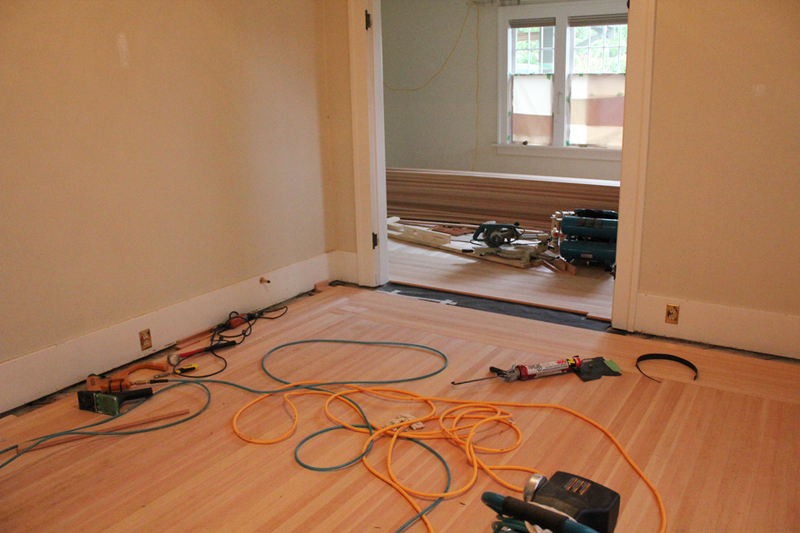 Thank goodness this is just about the most documented floor in the history of floor renovations. 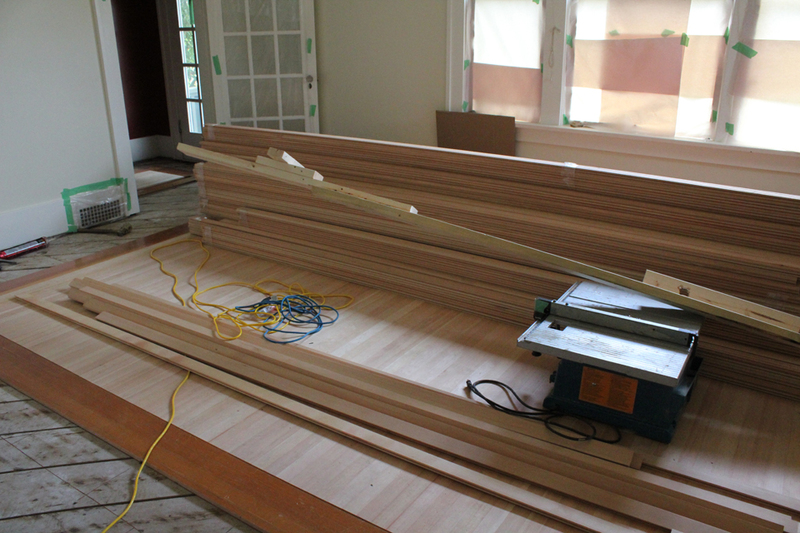 Several planks are being taken up as we speak and second marquetry feature strip is getting put in. Isn’t Robert just the bestest in the world? I think so! Got out of town. Well, this really wasn't what I had in mind. Tea cup Tuesday garden party between the rain! I just saw that you won something at Lady B.’s Time for Tea! Congratulations! Your floors look fabulous. All of your heart ache and mess will be worth it. Can’t wait to see the finished result! I really like the way that looks… fantastic! I guess I need to start paying more attention. Curious to see what this Boris looks like!